If a picture is worth a thousand words, Above and Beyond tells a big story about development  and the evolution of architecture  in Vermont. 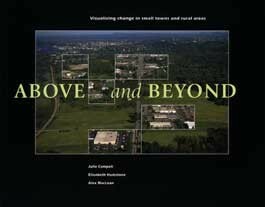 Published this year by the American Planning Association, the book is written by Burlington-based land-use experts Julie Campoli and Elizabeth Humstone and illustrated with images mostly from aerial photographer Alex MacLean. Above and Beyond is an atypical Vermont picture book, however, because it eschews the traditional postcard scenes and shows the inhabited parts of the Green Mountain State as they really are  ugly. Consider the tale told by MacLeans camera a few hundred feet over Merchants Row in Rutland. He has photographed a row of classic 19th-century commercial buildings with street-level storefronts and, overhead, finely crafted brickwork, windows and cornices decorated in the charming styles of that era  Italianate, Greek Revival and French Mansard. Roughly in the middle of the block is a deliciously garish anachronism: Vermonts first skyscraper, the seven-story Service Building, opened in 1930 and outfitted in the then-futuristic Art Deco mode à la the Empire State and Chrysler buildings in New York City. Collectively, these buildings comprise a vibrant downtown streetscape. But the story takes a turn for the worse in the next photograph. MacLeans lens has zoomed across the street to reveal a sprawling, one-story, 75,000-square-foot Wal-Mart, separated from Merchants Row by a vast, treeless parking lot. Many  including the authors of Above and Beyond  consider it a victory that the retail giant agreed to build in downtown Rutland rather than in a Taft Corners type suburban park. But others plainly consider the big box a functional definition of urban blight, minus the broken windows and graffiti. Providing a broad view, literally, of what has happened to Vermonts land over the past 50 years or so is the objective of Above and Beyond. Since Humstone and Campoli both live in Vermonts largest metropolis, the book puzzles in some detail over that areas particular vulnerability to sprawl, though not to the exclusion of other regions. The photographs show the Green Mountain State from Bennington to St. Albans, and they are organized according to what the authors see as the major themes in the current relationship of Vermonters to the land: incremental change; urban centers and urban edges; fragmentation; the lust for privacy and the resulting pre-eminence of private spaces over the public realm; the phenomenon of bigger-as-better in both residential and commercial spheres; and the effect of the automobile. The books emphasis on photos may earn it a place on coffee tables, but its discourse certainly will give readers something to talk about while getting caffeinated. In fact, Above and Beyond makes great reading for New Englanders who may be weary of foliage, steeples and covered bridges. But the earnest and detailed manifesto that accompanies each photo is hardly cynical. The authors have made it their business to foster a sense of responsibility to Vermonts landscape. Humstone is executive director of the Vermont Forum on Sprawl, and Campoli is a principal in the Burlington-based landscape architecture and planning firm Terra Firma Urban Design. Nobody comes to Vermont, either by birth or migration, with the explicit intention of ruining their surroundings, the authors acknowledge. Their pitch is to get people to notice the unintended consequences of their individual choices. As Jonathan Rauch recently pointed out in the Atlantic Monthly, its been known since the 1930s that human settlements array themselves in certain predictable mathematical patterns, to which homeowners and even developers are perfectly oblivious. This is called Zipfs Law, named for the Harvard linguist who also figured out, oddly, that the frequency of words in written English assumes a similar pattern. Essentially, Campoli, Hum-stone and MacLean are on a campaign to repeal Zipfs Law by getting people to see these patterns and consciously thwart them. There is often no clear turning point, only a slow evolution with regard to development, they point out, describing and illustrating how individual decisions create consequences that none of the individual actors intended. Examples: moving a factory out of downtown and near an interstate highway exit; widening commercial thoroughfares; designing a new neighborhood not as part of a villages street grid but as a self-contained enclave; building a dream home on five acres instead of a half-acre. Above and Beyonds compelling documention of these unintended consequences is no mere restatement of the points made by the classics cited in its bibliography  everything from Jane Holtz Kays anti-automobile rant Asphalt Nation to Jane Jacobs fabled 1961 defense of urban street life, The Death and Life of Great American Cities. Anyone can write or talk about these things, but it is quite another to prove them. Above and Beyond offers irrefutable evidence. Consider the series of photographs showing the progression of the National Life Insurance Company in Montpelier. The company has grown through six headquarters, leaving some decent architectural heritage in its wake  including a great Richardson Romanesque building on State Street, now occupied by the Vermont Agriculture Department. Ulti-mately, however, the insurance company settled on a bluff far beyond the city center in the isolated, fortresslike office park that is every I-89 travelers first glimpse of Vermonts capital city. Successful alternatives to this trend proved difficult to find and photograph, but Above and Beyond does include the 81-unit condominium complex at the corner of Battery and College streets in Burlington. Designed by Truex Cullins & Partners, the building features a distinctively undulating façade that adds welcome texture and variety to the downtown streetscape. Its lake views and city conveniences were presumably sufficient to convince well-heeled homebuyers to forego their country-estate dreams. The authors contrast this projects downtown-revitalizing land-use choice with the paved-paradise that is Shelburne Road. In extolling the virtue of such choices, Humstone and Campoli can be credited with consistency. Vermont has its share of hypocrites who pontificate against sprawl and then drive their SUVs to secluded homes on five-acre subdivisions of what used to be farms or forests. Campoli and Humstone live in bungalow-style homes on small plots in Burlington. Humstone walks a mile to her downtown office; Campoli walks downstairs to hers. MacLean, also a bungalow-dweller, lives in a Boston suburb on a somewhat less commendable 1.2-acre plot. For example, while waiting around for something that will make cars impractical, Campoli and her colleagues suggest at least rethinking where automobiles are stored. Cars can be tucked under and behind buildings, they point out. They credit San Francisco architect Daniel Soloman with having figured out how to do so. However, the authors of Above and Beyond appear to have little hope that architecture will become part of the solution rather than part of the problem. They applaud Wal-Mart for building in downtown Rutland rather than the outskirts, but fail to propose a world in which such blocky monoliths are no longer built. With regard to housing, the authors point out that high-quality design can make higher-density units attractive, but their proffered idea of such a design is a pseudo-Victorian development on lots  admittedly compact  in Stowe. A similar architecture of false references, Seaside in Florida, was used as the backdrop for the film The Truman Show for good reason: The effect is bland, conformist and nostalgic for a village life that never really existed. Its been a half-century since a gig in the San Francisco suburbs inspired folksinger Malvina Reynolds to write a song  later made famous by Pete Seeger  about little boxes on the hillside, little boxes made of ticky-tacky. Above and Beyond erases any doubt that ticky-tacky has spread to Vermont fields and hillsides. Thus its worth noting that Reynolds and Seeger werent just singing about sprawl; they were also railing against conformity, lack of imagination and the bad buildings that result. The authors of Above and Beyond will sign their book at a reception Wednesday, May 8, 5-7 p.m. at Wine Works Wine Bar in Burlington. Info, 864-6310.